Pupils at South Shields School are jumping for joy after achieving their best ever GCSE results. The school on Nevison Avenue has seen a vast improvement in its GCSE grades, with results in core subjects leaping by a massive 22% compared to last year. Pupils Kiera Helop, Rhya Watkinson and Jessica Mews opening their results. South Shields School has more than doubled the percentage of students who have achieved grades 9 to 5 in English and Maths, a grade considered by the Government under the new scoring scheme as a good pass. In English, 70% of students achieved a grade 4 and above, while 55% scored a grade 5 and above. In maths, 59% achieved a grade 4 and 44% scored a grade 5 and above in the same subject. Earlier this month, the Gazette reported how the school could close after failing to find a sponsor which would have enabled it to become an academy. Students picking up their exam results at South Shields School. 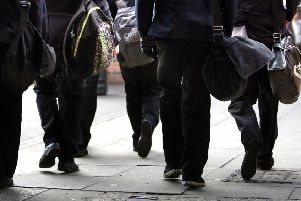 South Tyneside Council is preparing to launch a consultation process on September 13 on the future of the school - which was rated ‘inadequate’ by Ofsted in October 2017. On the impressive set of results, headteacher Allie Denholm said: “These are the best results in the school’s history. "These results today are the culmination of a massive amount of hard work from everyone at the school - staff, parents and carers, but most of all the students themselves. Pupil Keira Heslop who achieved three grade 9s. “Our commitment to career studies has been pivotal in pupil performance. "We’ve also dedicated a lot of time to encouraging our students to understand they’re bright, capable individuals, which has clearly allowed them to thrive during their exams. “We would like to personally thank parents and carers for their continuous involvement, with a brilliant number in regular attendance for revision sessions and after-school programmes. "These results are a testament to support systems at home and in school everyone connected with South Shields School should be extremely proud today. Delighted pupil Jack Thornton with his results. The Year 11 students at the school have achieved a staggering 22% increase in grade 4 and above in both English and Maths and a 20% increase in grades 5 and above. Top performing students included Keira Heslop, who earned three grade 9s in science and maths. Liam Carey and Anna Tennet picked up grade 9s in English and fellow pupil Chloe McGinnis achieved a grade 9 and a grade 8 in science.